Paula and I chatted on the internet last night (we've been using voice conferencing for almost 5 years, well before Skype) and Paula was telling me about a diaster involving Joel, a tube of toothpaste and Granddad's carpet, Oh Dear! Unfortunately this was followed up a bit later with poo - nice. It would appear from Joel's behaviour that he's missing Dad and dad is certainly missing Paula & Joel!!! After our conversation last night I could hear an owl in the back garden, so armed with the camera I managed to get a fairly decent photo (bear in mind it was pitch black and the owl was on the neigbour's roof some distance away). I've enhanced it a bit in Photoshop. 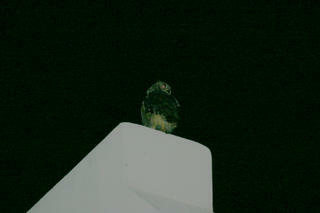 This a Spotted Eagle Owl and is a fairly regular visitor to our garden. At the back of our neighbour's house is the Lourensford river with a farm on the other side of that, so we do get some nice birds coming over.